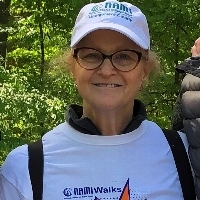 I am walking with NAMI (National Alliance on Mental Illness) because the work they do is very important to me. Our family has been affected by mental illness, and the resources that NAMI provided were a lifeline. For that reason, I also joined the board of NAMI-MC (Montgomery County) and am the board chairperson. NAMI is the nation’s largest grassroots mental health organization dedicated to building better lives for the millions of Americans impacted by mental illness. Thank you for supporting me and the critically important work of NAMI!